Bravely Default is a slave to the past. That’s not necessarily a bad thing. With Final Fantasy spinning off into it’s own weird amalgamation of modern day conventions and bizarre anime tropes, there’s definitely been a call for a return to the old-school, die-hard JRPG. Job-based upgrade paths, turn-based combat, random battles — it’s been a while since we’ve seen a game take these conventions and turn them into something that feels unique and exciting. And while Bravely Default definitely shakes up the formula enough while still adhering to its roots, its questionable narrative decisions end up making the whole experience fall flat. Stop me if you’ve heard this one before: the world of Luxendarc is governed by four crystals, each one representing a different element. Each of the crystals have been shrouded in darkness, causing untold devastation to the planet — including opening up a giant hole in the earth where Norende Village used to be. You play as Tiz, a farmboy from this village, whose loss spurs him on a quest to find out what’s going on. Along the way you’ll meet Agnès, a priestess in charge of resurrecting the crystals; Ringabel, a lecherous rake (currently suffering from amnesia, no less); and Edea, a defector from the Kingdom of Eternia. See, Eternia’s not a huge fan of the crystals, and will stop at nothing to put an end to your quest to travel the world and revive all four of them. It’s a narrative that would have been right at home on the SNES, and honestly, if it were called Final Fantasy: Bravely Default, I wouldn’t even bat an eye. Crystals, airships, thundaga — this is a Final Fantasy game in everything but name. But like the SNES JRPGs of yore, Bravely Default’s story is rife with cliches, and pads out its quests to the point of tedium. I won’t go into spoiler territory, but suffice to say there are numerous points in Bravely Default where I wondered why certain events were even happening. You’ll spend countless side missions (and several points in the main storyline) performing rote fetch quests — go to town A, talk to someone, walk to town B, get an item, walk back to town A, and so on. Chapter two bizarrely revolves around entering a beauty pageant and feels weirdly misogynistic; most of its events could have been excised without much consequence. For reasons I won’t go into here, you will spend an absurd amount of time revisiting the same locations and fighting the same bosses over and over again during Bravely Default’s final hours. And while there are hints of something greater as the story progresses, it takes around 25 hours to reach the payoff for all of its build-up. While these things all make sense from a narrative perspective, they don’t necessarily translate into compelling gameplay. While the narrative provides (or at least tries to) the crux of your motivation for pushing through to the end, Bravely Default’s battle systems will keep you coming back. During each battle, you’ll input all of the commands for your four warriors, hit “Go,” and watch the turn play out. While battles are a fairly conventional game of element-based rock/paper/scissors, the “Brave” and “Default” commands shake things up just enough to keep you on your toes. In addition to your standard health and magic point meters, you’ll also earn or lose “Brave Points,” or BP, during each battle. BP allows you to take additional actions during each turn — you gain one BP for completing your turn without taking an action, and you lose one BP for each action you take. By choosing “Default,” you go on the defensive while earning yourself additional BP; choosing “Brave,” however, lets you use multiple actions in a single turn. This risk-versus-reward system adds a whole new layer of strategy, as you decide whether you’re going to take as many actions as possible in the hopes of taking the enemies out all at once — overexert yourself and you’ll find yourself waiting to regain your BP as each of your foes gets to take free potshots at you. Winning battles earns you experience points to increase your characters’ levels, making them stronger, as well as job points, which will grant you new abilities within each equipped job. There are dozens of jobs to unlock and choose from, running the entire Final Fantasy gamut — Thieves can steal items from the myriad monsters, Knights focus on dealing damage and protecting their allies, various Mages specialize in healing and destructive magic, and so on. There are a vast variety of jobs to choose from, and picking the right job will determine whether you succeed or fail. While a lot of this may sound familiar to anyone who’s played a Square Enix JRPG before (and it certainly is), Square Enix has wisely added tons of modern bits and bobs to an otherwise conventional throwback, making the whole experience just that much more pleasant. First, and most importantly, is the inclusion of a fast-forward option in battle. Oh my God, this is possibly the greatest thing to ever happen to the genre. As soon as I found it, I turned on 4X speed and never looked back. You can also adjust the frequency of random battles — while it’s not a good idea to leave it off for too long, it’s definitely useful when you want to explore a dungeon for its hidden treasure chests. Bravely Default also includes a whole swath of social features, implemented through StreetPass. Every person that you register through StreetPass gets added to a list, and each can be used in different ways. Guests (people who simply pass by you) can be used to activate special attacks in battle — attacks that you might otherwise not have available for you at the time. People who are specifically registered as friends can be equipped to one of your four party members, and grant that character job skills that they might not have earned yet. Each person that you meet up with gets added to a Farmville-esque town, where you can assign them to rebuild various shops — the more shops you rebuild, the more items you get to purchase from each save point. And while it helps to have a bunch of friends who also own the game to help you out, you can still do all of this without passing by a single person — as long as you have an internet connection, you can add people to your town once a day. It won’t grow as fast as if you were a more sociable person, but it can still be done. 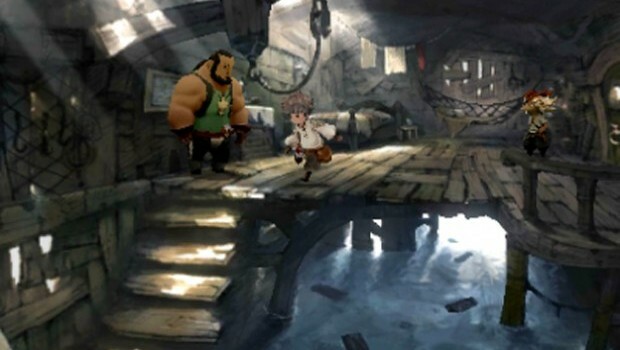 Bravely Default’s modern upgrades don’t end there — it’s a gorgeous looking game with a unique, painterly style all its own. While the plot may be all crystals and dungeons, the places you’ll go to move that plot forward constantly delight the senses. You’ll visit a desert city with a giant clock tower prominently featured smack in the middle, a homely castle town, even the snowswept headquarters of the very people who are chasing you down. Each job looks unique and distinct, and save for a small handful, all look just as awesome as the last. Its Final Fantasy Tactics-meets-Playmobil art style may seem a bit incongruous with the heady themes and the surprisingly bawdy dialog, but there’s no question that Bravely Default completely owns it. Square Enix has also added another modern feature that’s more questionable than the others: the inclusion of in-app purchases. For every eight hours you leave Bravely Default running while the 3DS is in sleep mode, you’ll earn one Sleep Point, up to a total of three. Sleep Points allow you to pause combat at any time and take up to four additional actions with one character, each action consuming one Sleep Point. If you don’t want to wait the 24 hours it takes to fill up your Sleep Points, you can spend real, human dollars to top up. It’s a weird thing to include to bum a couple extra bucks out of an already $40 game, but luckily, it’s never a necessary thing to worry about. I used Sleep Points a total of two or three times during my entire run — and it was mostly just to see how the whole process worked. I’ve been back and forth on Bravely Default since I started playing it. I loved the old-school vibe and the entertaining battles, but grew bored with the tired and cliche-riddled plot. I kept plowing through, hoping it would eventually go somewhere. It’s exciting when it finally does, but Bravely Default can’t reconcile its lofty narrative goals with its strict adherence to genre conventions. The best throwbacks are the ones that are able to evoke a sense of nostalgia for a time of games remembered, but still push the genre forward in meaningful and exciting ways. Bravely Default gets about half of that right.